Oh, the pig. What can’t it do for our cooking? Add a little pork fat to cooking and the flavor goes through the roof. Then add a little Pig Cooking Lid to your cooking and keep it from going through the roof. Or at least from boiling over. 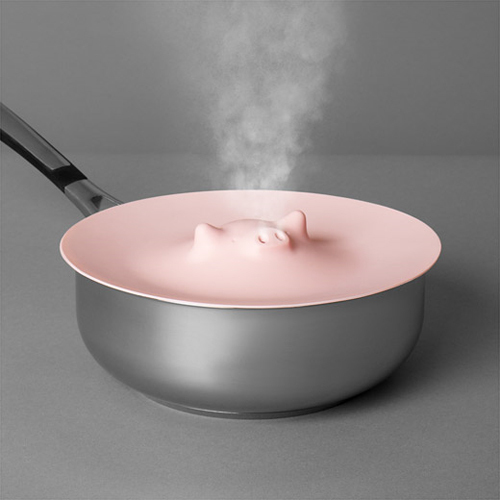 This Pig Cooking Lid is made of soft silicone with a pig face in the center. This multipurpose lid can be placed directly over ingredients in a pot to help them cook evenly, releasing steam through the pig’s snout. It can also be used to cover food in the microwave, and as a grip to open lids. Dishwasher- and microwave-safe.